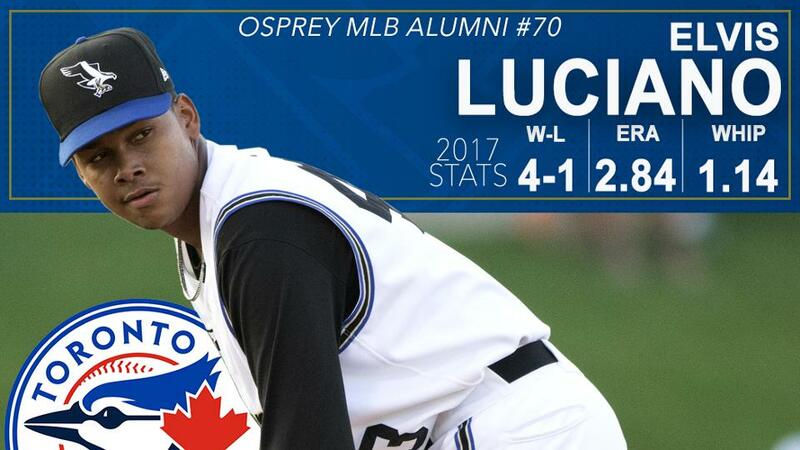 Former Missoula Osprey pitcher Elvis Luciano has been selected as a member of the Toronto Blue Jays 2019 Opening Day roster - when the 19-year-old first steps on the rubber he will become the 70th Missoula alum to make their MLB debut, the first from the 2017 team, and the first ever MLB player born in the 21st century. Luciano signed with the Arizona Diamondbacks as an International Free Agent out of Boca Chica, Dominican Republic in October of 2016. The potential he showed in his 2017 pro debut proved to make him one of the best finds in the 2016-2017 international crop, posting a record of 4-1 with an ERA of 2.84 and a 1.14 WHIP. In June of 2018 the D-Backs cashed in on his upside by packaging him with LHP Gabe Speier to acquire OF Jon Jay from the Kansas City Royals. The Royals viewed Luciano (just 18-years-old at the time of the trade) as the equivalent of a top-two-rounds Draft pick - after ultimately leaving him off of their 40-man roster ahead of the 2018 Rule 5 Draft, the Blue Jays called Luciano's name with the 9th selection in the 1st round. With just two professional seasons under his belt - and no appearance higher than Advanced Rookie ball (skipping Low-A, Adv-A, AA & AAA levels) - Luciano will get his first taste of full-season baseball in the big leagues as a member of the 2019 Blue Jays bullpen. Luciano has been scouted with a plus fastball with great movement, a plus curveball, and a changeup that can miss bats as well. As the 19-year-old's command continues to develop, he has a difficult road ahead to prove successful in the big leagues, but his athleticism combined with his arm talent will allow him to compete immediately at the highest level. MLB Opening Day is slated for Thursday, March 28 - many former Osprey will to take the field with their respective MLB franchises and look to start the 2019 campaign with a bang. Keep an eye out tomorrow, as we will highlight all of the Missoula alumni to suit up with their big-league clubs. We are just 86 days away from the return of baseball to Missoula - Season Tickets and Flex packages are available now and can be purchased at the MSO Hub, by phone at (406) 543-3300 or online at MissoulaOsprey.com.